Title: "Creating an Artificial Nature as an Open World""
Title: "Creating an Artificial Nature as a Generative Art"
Alien-field, a 2008 prototype for AN project is introduced at this media art exhibition whose charter works as a pre-exhibition for the Telematics Media Facade visualization project October 2011. Installation: "Artificial Nature: Time of Doubles"
Invited installation of the third version of Artificial Nature at SOMA Museum of Art as one of five artworks under the theme of 'type:wall' as interactive wall participation among sound, ice, breathing, shadow and interactive walls. Installation: "Artificial Nature: Fluid Space 2.5"
Artist Talk: "Artificial Natures: Creating Nature-Like Aesthetic Experiences through Immersive Artificial Life Worlds"
Max/MSP Jitter Workshop: "Creating Strange Loops"
Computer Science Colloquium: "Creating an Open World as an Infinite Game"
Collider 3: Transform Artists Haru Ji and Graham Wakefield, Jonathan Harris and Sep Kamvar, Eunsu Kang, Philomène Longpré, Chris Yanc Collider 3: Transform explores the influence of technology and art on the essence of the human condition. The Collider series is co-curated by the director of the Emily Davis Gallery, Rod Bengston, and UA Assistant Professor of Graphic Design Tony Samangy. The series examines the impact, implications and inspiration of the phenomenon generally categorized under the umbrella term “New Media” within design practice and the fine arts. Installation: "Artificial Nature: Fluid Space"
Invited installation of Artificial Nature at Hyperbody ProtoSPACE, TU Delft. Accompanying lecture & workshop delivered by Graham Wakefield. Haru Ji: "A-Life Worldmaking as a Contemporary Art"
Publication: Chap.17 "Immersed in Unfolding Complex Systmes"
With contributions from more than two dozen experts, this book demonstrates why visualizations are beautiful not only for their aesthetic design, but also for elegant layers of detail that efficiently generate insight and new understanding. Think of the familiar map of the New York City subway system, or a diagram of the human brain. These older examples have been surpassed by artists, designers, commentators, scientists, analysts, statisticians, and others who show how visualizations using today's digital capabilities can help us make sense of the world. Presenter, Writing: "Change & Adaptation in Media Ecology (미디어 환경에서의 변화와 적응)"
Art Gallery : "Artificial Nature: Fluid Space"
The 2nd ACM SIGGRAPH Conference and Exhibition on Computer Graphics & Interactive Techniques, Yokohama, Japan. Some of the most impressive breakthroughs in art and technology happen by considering the gaps and opportunities in the existing landscape - by adapting what we know to what might be. Now, as the world evolves with exponential speed, we need artists and scientists to show us the way. 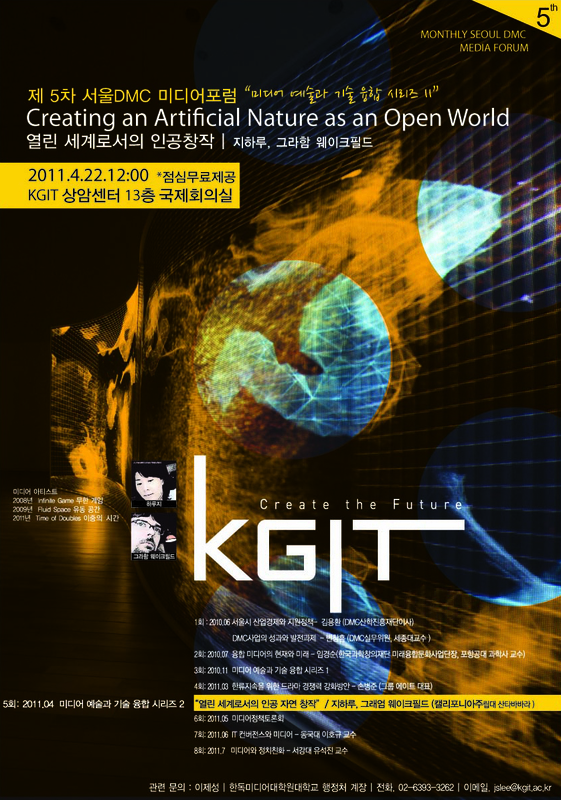 The Art Gallery and Emerging Technologies exhibitions at SIGGRAPH Asia 2009 share the theme of Adaptation. The Art Gallery features a diverse, international body of work, ranging from pieces driven by technology to works that critically comment on our technological society. "A 360-Degree Virtual Reality Chamber Brings Researchers Face to Face with Their Data"
Scientific American features the AlloSphere. "Scientists can climb inside the University of California, Santa Barbara's three-story-high AlloSphere for a life-size interaction with their research." 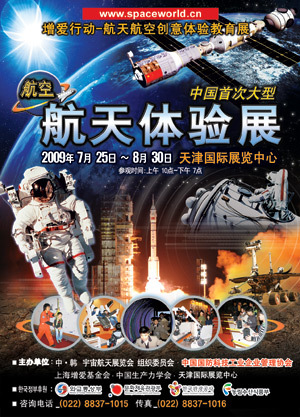 The Space Exploration Exhibition, organized by Chinese and Korean government agencies for the Chinese public. 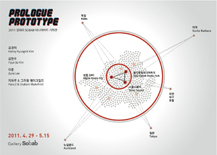 To be shown in five differnt cities throughout China from 2009-2011. 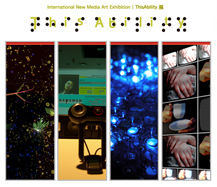 ThisAbility is an international new media art exhibition examining themes of human capability through creative transition of the senses. The exhibition features twenty one interactive electronic artworks mainly including: a digital musical instrument played by facial gestures; a visual block transforming Braille into sound; and a table converting your touch into light. Paper: "Artiﬁcial Nature: Research and Development"
This conference targets on sharing diverse information on media art and interactive technology by gathering media artists and core researchers from all over the world to understand each other's way to build up the strong worldwide research community. 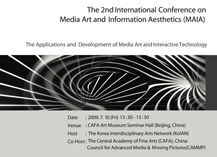 This conference expects to have a good sample of the media art and interactive technology exchanging hub. SUB/SCAPE is a generative sound performance of audio & visual processes performed by four artists, Yutaka Makino, Lance Putnam, Wesley Smith and Graham Wakefield from the Media Arts and Technology program, UCSB, USA. Additionally Performative, a group of interactive technology installation artists, introduce their show-reel. It is co-hosted by MAAT from Soonsil University, Korea and MAT in UCSB, USA. 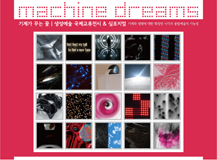 Machine Dreams is an international exhibition and symposium of advanced generative arts: creating artworks out of computational processes or automated mathematical systems. At the exhibition you may experience generative art manifesting the imaginative intellectual play between art creation and scientific research, and at the symposium we will take part in discourse upon the notions of the generative expressed through the artworks in the exhibition. The symposium brings together international artists, researchers and educators to examine the non-traditional characteristics of generative arts and the necessity of interdisciplinary education. Through the presentation and discussion of the expanded inspirations and implications of interdisciplinary computational arts we seek new conceptions of the human and the machinic. MAT Ph.D Students: Reza Ali, Rama Hoetzlein, Lance Putnam, Wesley Smith, Graham Wakefield, Haru Ji gave artists' presentations to the department of Art, UCSB (approximately 200 students in attendance). Installation: "Artificial Nature; Fluid Space"
A.L.I.C.E. MUSEUM 2009 consists of creative perception, learning, and action for Artistic, Lively, Intelligent, Creative, and Eco-friendly Kids. Publication: "Artificial Nature: Immersive World Making"
This book constitutes the refereed joint proceedings of eleven European workshops on the Theory and Applications of Evolutionary Computation, EvoWorkshops 2009, held in Tübingen, Germany, in April 2009 within the scope of the EvoStar 2009 event. The 68 revised full papers and 23 revised short papers presented were carefully reviewed and selected from a total of 143 submissions. With respect to the eleven workshops covered, the papers are organized in topical sections on telecommunication networks and other parallel and distributed systems, environmental issues, finance and economics, games, design automation, image analysis and signal processing, interactive evolution and humanized computational intelligence, music, sound, art and design, continuous parameter optimisation, stochastic and dynamic environments, as well as transportation and logistics. Paper: "Artificial Nature; Immersive World Making"
EvoMUSART 2009 is the seventh workshop of the EvoNet working group on Evolutionary Music and Art. 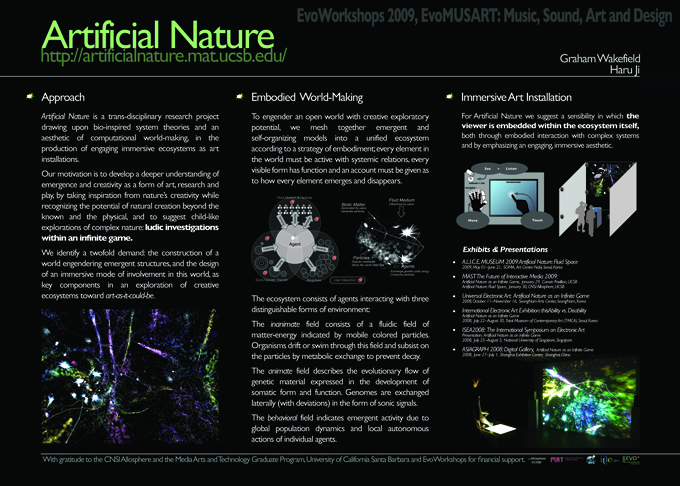 Following the success of previous events and the growth of interest in the field, the main goal of EvoMUSART 2009 is to bring together researchers who are using biologically inspired techniques for artistic tasks, providing the opportunity to promote, present and discuss ongoing work in this area. JoAnn Kuchera-Morin introduces the AlloSphere, an entirely new way to see and interpret scientific data, in full color and surround sound inside a massive metal sphere. Dive into the brain, feel electron spin, hear the music of the elements. The TED stands for Technology, Enterntainment and Design, aiming to bring together visionary people to discuss the future. Paper + Installation: "Artificial Nature"
The goal of this workshop is to bring together leading digital media researchers and practitioners who work at the intersection of arts and engineering, in order to explore key challenges and promising directions in digital arts, experiential media systems, creative environments, and emerging media technologies. 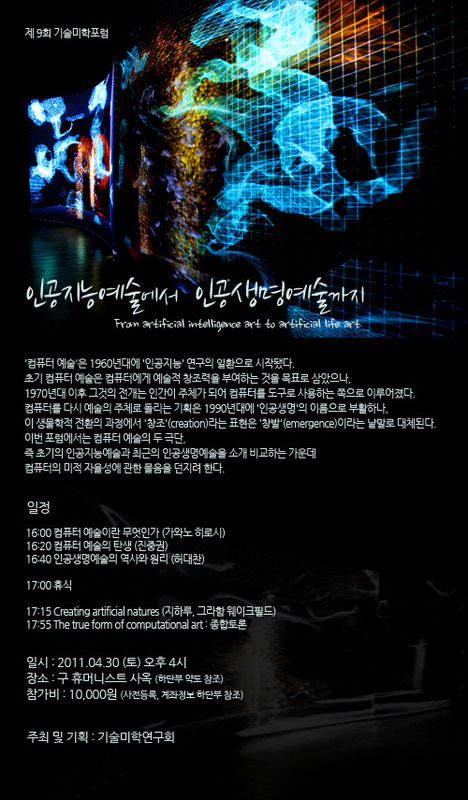 Installation: "Artificial Nature as an Infinite Game"
An exhibition, or 'space of illusion,' comprising future-oriented technological and interactive media art by distinguished international artists from Korea, Germany, the USA, Italy, Japan and the UK. Looking at Disability through Creative Senses. "thisAbility vs. Disability" is an international electronic art exhibition looking upon themes of disability through creative transition of the senses. You can experience and enjoy ten fascinating interactive electronic artworks, including: a painting seen through your hand by the touch of the wind, a digital musical instrument played by facial gestures, a robot responding to your voice, a table transmitting your hand's touch into light, a block transforming Braille into sound, a harmonic bell playing according to your heartbeat, and so on. 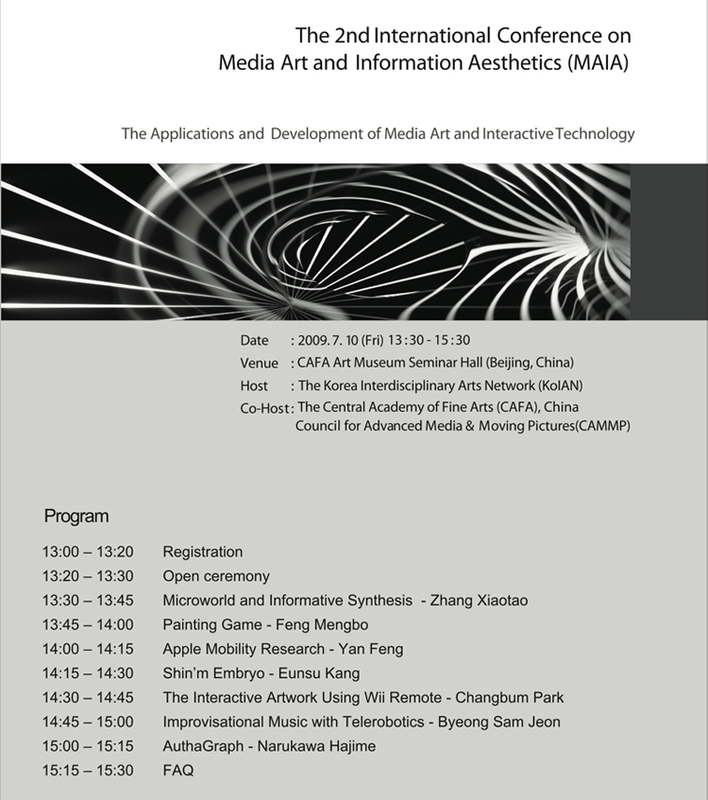 The International Symposium on Electronic Art. Presentation: "Artificial Nature as an Infinite Game"
ISEA, the International Symposium on Electronic Art initiated in 1988, is the world's premier media arts event for the critical discussion and showcase of creative productions applying new technologies in interactive and digital media. Held biannually in various cities throughout the world, this migratory event is being held in Asia for the second time in its history, after Singapore successfully secured this bid. ASIAGRAPH is an organization that involves cooperation between people, government, corporations and universities in Asia, as well as an exhibition event for the purpose of reaching a more prosperous human life by elements from Asian culture together with IT technology. Media and technology graduate student Haru Ji, the space's architect, said the aim is to provide students and faculty with a campus only possible in a synthetic world. "[I tried to create something] we can experience only in virtual space, not in our physical first life" Ji said. "I hope this place can offer you a good place to explore your events and identity." Copyright © 2004-2011 Haru Ji. All rights reserved.